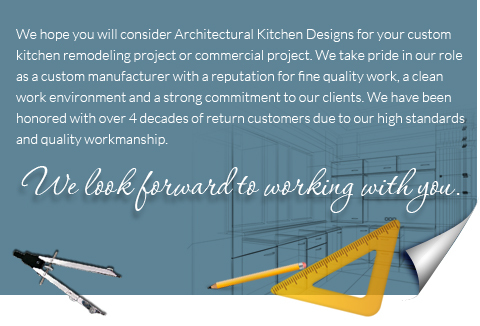 Architectural Kitchen Designs is a family remodeling company in Stratford, Connecticut (CT) that has been owned and operated by John Rehm since 1975. 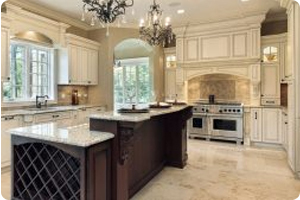 We specialize in custom cabinetry, kitchen remodels, bathroom remodels, home additions, home remodeling services, commercial remodeling services, millwork, garages, basement remodels and more in and around our community of Stratford, Fairfield, Westport, Woodbridge, Orange, Trumbull, Stratford, Milford, New Canaan, West Hartford, Darien and surrounding communities in Connecticut (CT). For decades we have watched this industry closely to make sure we are always one step ahead of the curve. We are a complete resource for fine custom cabinetry for any room in your home. Whether looking for a traditional “Old World” style kitchen or something fresh and new, Architectural Kitchen Designs has been offering its customers the hands on attention of a family business for years. We at Architectural Kitchen Designs are trusted builders in CT of exceptional custom cabinetry committed to understanding your vision and style. In over 4 decades of building fine custom cabinetry, John has learned that we owe our success to our clients. When it comes to creating the kitchen that you have always dreamed of, we pride ourselves on our master craftsmanship giving you an exceptional product. 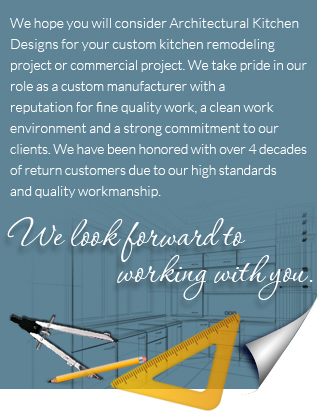 Our passion reflects our commitment to quality and workmanship which is the key to our success. Simply put, every great plan is only as good as the professional that executes it. Our Stratford, CT remodeling company prides itself in overseeing every single detail of your project, from a simple library to a complete home renovation. We guarantee Architectural Kitchen Designs will produce products of only the highest quality and craftsmanship. If custom cabinetry is not within your budget we also offer more cost effective semi- custom and stock cabinetry to fulfill all of the needs that our clients may have. With that being said we are completely conscious of the quality of these lines because we know cabinetry from the inside and out and would only offer the best. We also guarantee AKD will produce products of only the highest quality and craftsmanship. At AKD we strive to exceed our customer’s expectations. We challenge ourselves to continually expand our knowledge to bring you only the best. We put a certain type of love into our remodeling work, and we’re pretty sure you will love it too. Let us take your vision and turn it into your reality.